Welcome to Tween Girl Style Magazine (TGSM). A place that features latest trends, upcoming models and news for girls ages 7 – 13. Our magazine is a resource center for young girls where they can find trendy new looks, celebrity news and enter fun modeling contests to win prizes. So, do you have a video or a picture to share of your tween? Are you a tween blogger who can offer fashion tips and advice? Do you have knack for style and DIY projects that tweens would love? Or are you just looking for a place that your tween can stop by, have fun and get cool tips and fashion advice? No matter what it is, we are the place for you and your tween. 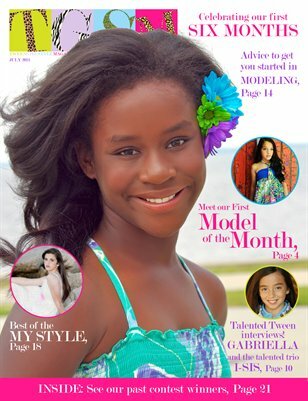 TGSM was created to fill a need for more tween centered magazines for girls that love to model. We wanted to create a place that was family friendly and place young girls would enjoy reading.